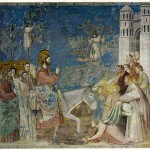 Controversy surrounds the Italian artist Giotto di Bondone. Scholars offer differing opinions on everything from whether his father was poor or well-to-do, a landowner, a sheep-herder, a blacksmith or a peasant to where he is buried. I also found varying opinions as to his appearance. Most agreed that Giotto was perhaps shorter than average and not particularly handsome. The statue to the left, which can be viewed at the famous Uffizi Gallery in Florence depicts a stern-faced man of a somewhat short stature. Historical accounts vary as to how Giotto came to be an artist. A few have proclaimed his genius so absolute as to have not required any instruction – a theory, yet another scholar rightly laughs off as ridiculous. Theories abound as to which frescoes he painted and even the buildings he may have worked in. Paintings once attributed to him are now thought to be by another artist. 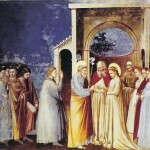 Paintings, once attributed to his teacher, are now being attributed to Giotto. Giotto inadvertently caused some of this confusion. He was said to be a humble man, neither referring to himself as “master” (a term more likely to be recorded in historical records) or signing much of his work. His year of birth, also in debate, was sometime between 1250 and 1270, most believe it was 1266/67. 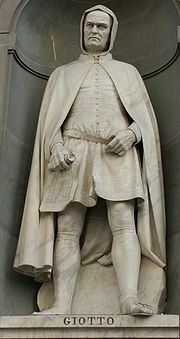 The town crier of Florence, Antonio Pucci wrote a poem honoring Giotto which said he died at 70. Some believe that the word 'seventy' fits into the phrasing so well that it was simply used for artistic convenience and Giotto actually lived past 70. Controversy aside, any discussion of Italian art and famous painters would be incomplete without including the artist Giotto. And, every reference I referred to in creating this biography for The Famous Artists agreed that Giotto's style was revolutionary. Giotto lived in the late Middle Ages and may have been the first artist to contribute to the Italian Renaissance. Most artwork being completed was for use in cathedrals and churches; stained glass was the dominant art form. Paintings and frescoes often relied on gilding for beauty. Italian painters were following the “Greek manner”, also referred to as the neo-Byzantine style. Italian architects and sculptors, on the other hand, were following a more Gothic style. 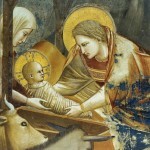 Around 1300, Giotto began merging the two styles. Giotto's legend has him being born in or around Florence. A variety of theories have emerged regarding Giotto's father. Early accounts proclaim his father was a peasant who owned a bit of land while others identify him as a well-to-do landed proprietor. A more recent theory is that his father was a Florence blacksmith. 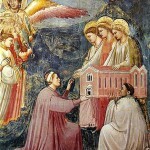 Three fairy-tale-esque stories have emerged as to how Giotto became a painter. In the first, Giotto is apprenticed to a wool merchant and abandon his duties, preferring the workshop of the Florentine painter Cimabue to the fields. Another legend has the child Giotto being discovered by and apprenticed to Cimabue to work at the Assisi Cathedral after the elder artist saw Giotto's drawings of his father's sheep drawn with a sharp stone on slate. A third legend has Giotto touring the great art centers of the world as a son of a wealthy man and being inspired by the art he encountered. Most historical accounts agree that the young Giotto spent much of his time in the out of doors. Whether he was tending his father's sheep or that of a wool merchant or traveling the continent, many agree that his time spent in the natural world impacted his art. 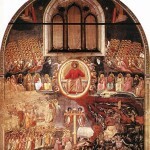 Most believe that Cimabue invited the younger artist to join him at the Church of Assisi. Giotto was influenced by the traditional flat-patterned art of Cimabue and painters from Rome whose art reflected the more rounded form of the ancient sculptures in Eternal City. Giotto combined the two styles, something that simply had never been done before. Previously, artists often let canvas size dictate where people were added rather than maintaining life-like spatial relationships. They also offered a bird's-eye view perspective. Giotto was primarily a wall painter rather than a panel painter. His subjects appeared more life-like, sculptural and three dimensional. Clothing followed the body, tugging across the back of someone with outstretched arms or stooped posture. His works provided an eye-level, first-hand perspective that put the observer on an even level with the inhabitants of his paintings. He's believed to be the first artist to intentionally create a relationship between the picture and the beholder. Unlike other artists, he used the figures, rather than the surrounding architectural elements, to create his picture space. In 1300, after having served as director of the Assisi project, Giotto was called to Rome by Pope Boniface VII to help celebrate the Jubilee of 1300. At least one historian believes that by this time, Giotto owned large estates in Florence, was receiving commissions throughout Italy and leading a large workshop. Around 1305, Enrico Scrovegni invited Giotto to Padua to decorate a Chapel with scenes from the lives of the Virgin and Christ. Scrovegni's father had been a notorious moneylender who was even depicted in Dante's seventh circle of Hell. Enrico built the Arena Chapel to honor the Virgin Annunciate and hopefully earn salvation for his deceased father's soul. Scrovegni presents the chapel to three angels in A Last Judgement. This work is perhaps Giotto's greatest and the one most representative of his style. Unlike the frescoes at the Basilica of St. Francis of Assisi, the works at the Arena Chapel are universally attributed to Giotto. Giotto's appointment as the head of the Florence Cathedral workshop may have began “the era of painting.” Traditionally, a position reserved for architects and sculptors, Giotto was the first painter to be so honored. Giotto was among the first artists and craftsmen who were associated with their works and remembered long after their deaths. Scholars disagree to his birthplace, whether or not he worked with Cimabue and even if he was as instrumental in the Assisi frescoes as he is often given credit for. He is believed to have died in 1337 but there's much debate even over his final resting place – Santa Maria del Fiore, the Cathedral of Florence or the Church of Santa Raparata. He is believed to have married Ricevuta di Lapo del Pela, Ciuta, in 1287. They may have had as many as eight children together, one of whom became an artist. 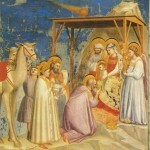 The works included on The Famous Artists are to the best of my knowledge ones painted by Giotto. Since the attributions works associated with Giotto continue to change, I will try to keep this information as accurate as possible.